A Worley, Idaho, man admitted to leading Montana authorities on a pursuit in a stolen truck while handcuffed this past April. 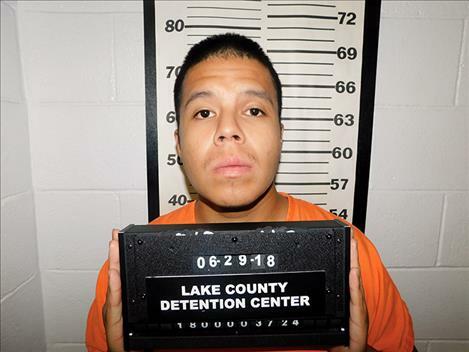 As part a plea agreement, Aaron Montana Crowe, 23, pleaded guilty at District Court in Polson on Aug. 8 to felony counts of theft and criminal endangerment. According to court records, on April 25, Lake County emergency dispatchers received a call that a silver passenger car hit a delineator post on Highway 28 near mile marker 41. Montana Highway Patrol Trooper Chan Berry met up with the reporting parties at the intersection of Highway 28 and U.S. Highway 93. As the suspect’s vehicle was approaching, the witnesses were able to point the silver car out to Berry, who caught up to the car and initiated a traffic stop. Crowe, who was driving, allegedly did not respond to Trooper Berry’s orders to either pull the car to the side of the road or turn the engine off. The trooper reached in and turned the car’s engine off and took the keys. As the trooper was placing the keys on the hood of his patrol car, Crowe’s passenger, Kendal Sijohn, got out of the silver car and began “thumbing for a ride.” Witnesses yelled to the trooper that Sijohn was driving when the suspects hit the post. The trooper yelled for Sijohn to return to the scene, but Sijohn ignored the order. Meanwhile, surveillance from the trooper’s patrol car shows that Crowe exited the silver car, got into the patrol car and tried, unsuccessfully, to put it into gear. This vehicle swap was seen by Chief Cliff Fire Chief Andrew Learn as he arrived in a Dodge pick-up. Chief Learn left his Dodge running with the flashers on to move the trooper’s patrol vehicle as per the trooper’s request. Crowe then left the vehicle and approached the trooper, who handcuffed him. While the trooper was detaining Crowe, Sijohn wandered into the northbound lane of Highway 93. The trooper then left Crowe, attempting to round up Sijohn. While unattended, Crowe took the opportunity to flee. He managed to get his handcuffed hands in front of him, and got into Learn’s unoccupied pick-up. Noticing that his vehicle was leaving without him, Learn got in an arriving firetruck and followed Crowe, who had pulled out in front of another vehicle, and was driving erratically. Crowe’s driving allegedly forced 15 to 20 cars off the road, reaching speeds of up to 90 to 100 miles per hour, driving from shoulder to shoulder. Crowe eventually pulled over in a gravel pit near Brown’s Meadow Road. Learn attempted, unsuccessfully, to box in the vehicle. Lake County deputies became involved in the pursuit at this point, and Crowe eventually stopped in the middle of the road and was arrested. His blood alcohol content would later register at .170 during the booking process. The plea agreement calls for deferred sentencing for three years on each count for a total of six years. District Judge James Manley set sentencing for Sept. 12.